How do I apply aquaTIGHT®? To what surfaces should I apply aquaTIGHT®? Interior/exterior real stone tiles. i.e. tumbled marble, slate, travertine etc. Interior/exterior real or false stone veneers such as flagstone, brick and any other natural stone surface. Interior and exterior mortar or grout joints. aquaTIGHT® GS and aquaTIGHT® HydraGuard should be applied to any cement or concrete surface as a first response water barrier to water contact. A clear concrete sealer is available right here. aquaTIGHT® GA is designed to be mixed directly with grout as an additive. To see which aquaTIGHT® product works best with which surface, please see our Products Comparison chart. What happens if aquaTIGHT® comes in contact with metal, such as my fixtures? Other than improved water beading, you will see no effect. Is there any chance of causing serious damage to my surfaces or construction project from misuse of aquaTIGHT®? No. All aquaTIGHT® products have a neutral pH (7) solution that is non-flammable. All products have a very low VOC content, and all the components of aquaTIGHT® are chemically stable. It acts as a clear concrete and other material sealer without harming anything else. What substances would strip away the sealer from the grout (such as bleach or other cleaners)? Very strong acid (such as sulfamic or muriatic acid) can temporarily loosen the bond between grout and aquaTIGHT®. However, this is not recommended, since damage to the grout could be substantial, and removal of aquaTIGHT® would only be partial. Are there particular chemicals or cleansers I should avoid using on aquaTIGHT®-treated surfaces? 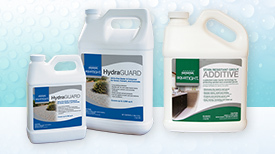 Ammonia, quat salts, and enzyme cleaners have the potential to destroy grout of any kind with or without the use of aquaTIGHT®. 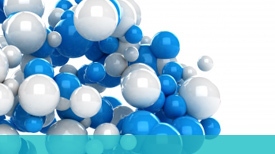 All cleaning chemicals should first be tested in an inconspicuous area, and mild surfactant cleansers are recommended. How do aquaTIGHT® sealers interact with silicone-based caulk? aquaTIGHT® will not bond to or discolor silicone-based caulk. However, to the extent that the caulk does not adhere to the surface, aquaTIGHT® can penetrate behind the caulk to protect the underlying surface. Should aquaTIGHT® sealers be applied after caulking or before? The concrete and grout sealer is best applied before caulking because the caulk may prevent the sealer from penetrating to the underlying surface. aquaTIGHT®-treated surfaces will adhere to caulking. Will aquaTIGHT® prevent the adhesion of caulk and silicone after silicone has been applied? Applying aquaTIGHT® will not prevent the adhesion of any silicone or latex based caulks. Efflorescence – Can I use aquaTIGHT® Sealers on effloresced surfaces? Can I seal over white stuff growing on my stone, tile, or other masonry surfaces? No. Do NOT seal over any salt formations or calcified growth materials. Do NOT seal over any powdery substances clinging to any floor or walls surfaces. aquaTIGHT® offers a efflorescence cleaning solution and sealer kit called aquaTIGHT® EFX Prep and Seal. Learn more by contacting us directly or send us your contact information using the contact us form. Efflorescence is not a simple to clean process without the right knowledge, chemicals and experience. However, with the right training, education and know-how, you can be a pro at mitigating efflorescence, too. Should I pre seal my natural stones and tile prior to grouting or placing mortar between my joints? The rule of thumb is to check for staining on your tile, stone or flooring item before installation of the aquaTIGHT® grout additive. We recommend buying an extra few pieces of tile, stone or other surface item; test for staining first, then test for staining after sealing. If staining is less after sealing than before, go ahead and choose to seal before installation. Will porous natural stones, like bluestone from Pennsylvania or imported from China, begin to effloresce? All natural stones, while installed into a natural environment or where moisture is constantly present (including ambient temperature air), will aid in making efflorescence appear visible. It is important to research using additives into your mortar mixes that will reduce the alkalinity of your Portland based cement. Always test a small area in an inconspicuous place before sealing bluestone so not to trap the salts that will naturally migrate outward. Follow stone retailers suggestions for best installation practices and allowing efflorescence to escape. How do I know if I have efflorescence? Most cementitious systems and the stones or tiles installed on, over and around Portland cement will begin to form efflorescence over time. If you are not sure of what you have, we offer testing services and scientific materials analysis. To inquire about testing, click here. My grout appears and feels dry or too dry after adding the additive. What do I to make the grout the consistency needed? 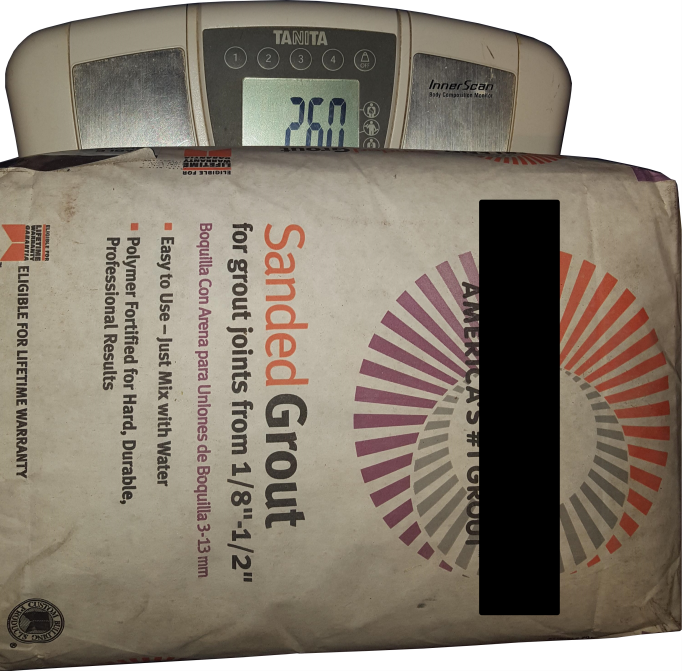 Recently weights of grout bags produced by multiple companies have been weighing more than what is printed on the bags as this picture illustrates. Our additive fluid levels are enough to handle UPTO and less than <25 lbs. Greater than >26 pounds will require my hydration to meet the water demand of the portland cement grout. Meeting the hydration demand is achieved by adding >2 and less than <5 ounces more water. Of course if you prefer a consistency you are familiar with then adding distilled water is an option. We don’t recommend tap water because it varies from place to place and there isn’t any way to know what contaminants are in the tap water.